The Pit Stop Process will quickly measure and diagnose how your employees, teams and your organisation as a whole can immediately start to measurably improve performance where you need it most. The entire Pit Stop Process can be completed in less than two elapsed weeks and we offer this service to our UK clients at zero cost. Our research into the F1 environment has highlighted that the best teams deploy a systemic approach to improving performance. In preparation for the design of any programme designed to measurably improve performance, the logical first step is to establish an independent assessment of where you are right now. Any systemic approach to improving performance must encompass all of the Organisational Factors alongside all of the People Factors that directly influence overall performance as shown on the High Performance Race Track below. The Pit Stop Process will quickly highlight the particular sections of the High Performance Race Track that are currently limiting your performance. How many of your previous initiatives to improve performance have really delivered a positive return on investment? 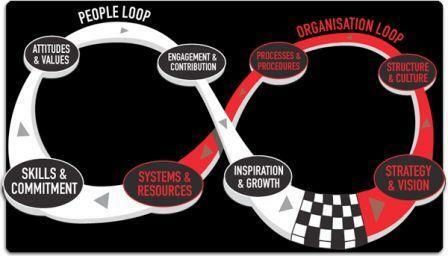 Many organisations have been attempting to react to the symptoms of their performance challenges not the root causes? What will a winning performance look, sound and feel like? How will we measure that winning performance and how valuable will it be to achieve it? What are the specific root causes that are blocking our performance right now? When can we tell our senior stakeholders to expect a positive return on investment? By rapidly answering these questions accurately and specifically during the Pit Stop Process we help you to target a positive return on investment in the shortest possible timescales. Not only that, we will GUARANTEE that the F1 Performance Programme that we will tailor specifically to your needs will deliver to you a positive return on investment within 180 days. Our team of performance specialists drawn from all fields of learning and development utilise this diagnostic approach to propose the most powerful and impactful intervention for your business needs. Every organisation has had some experience of development/training programmes that offered much yet failed to improve business performance, so ensure that your next development intervention really delivers where it matters most - the bottom line. The Pit Stop Process sets the agenda, the next step is to ensure that you comprehensively plan to realise a Positive ROI. Click this link to discover more.